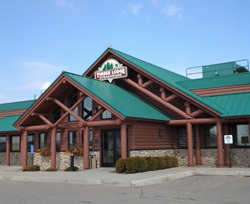 Timber Lodge Steakhouse in Owatonna is locally owned and indepentently operated by Midwest Restaurant Group. We have been part of the local community for more than a decade and take pride in providing you with high quality food, exceptional service and warm hospitality. Rigorously prepare all food items utilizing the highest quality ingredients available consistent with the highest restaurant industry standards and guidelines. We will always keep in mind that exceeding guest's expectations is our primary goal. Fast, friendly, courteous, professional hospitality making the guest feel that they are our sole priority. Maintain an active role in generously supporting our community, neighbors and environment. Develop a supportive team-oriented environment based on trust and respect. We will make certain all employees are treated as equals. We will always keep in mind that the Timber Lodge Dining experience has to present a great value for our guests. We will strive to offer all Timber Lodge menu items at the lowest reasonable price.